Gloria's life began spiraling out of control in the early 80's when she decided to use drugs. Gloria has been in and out of prison totaling well over 23 years: 7 months fed time, 3 and a half years state time and 13 and a half years state time again, and lastly 7 years state time and countless months spent in and out of county jails.). This is now in the past. At 57 years old Gloria decided “no more prison” and meant it. Soon after Gloria was released from her last 7 year sentence on July 12th, she became involved with MUM (Madison Urban Ministry). A peer supervisor Janice Ocejo opened doors for Gloria which she gladly went through. These open doors led to the job center where she met FSET Case Manager Bill Stahl who assisted her with the means to obtain employment. 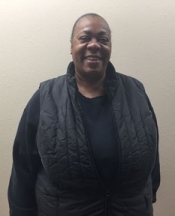 FSET also helped Gloria get a driver's license and offered transportation assistance for employment search and job retention. "Many including Mr. Stahl believe my story should be told to others in situations common to mine. Today I am drug free, working, moving into a sober livening home, attending church and highly motivated to succeed. For the first time in a long time, I feel free on the inside. I am very thankful for the people who helped me change direction to the life I live now. Without God, my choices to succeed, and MUM, the Job Center, the Salvation Army and the DOC, I would not be where I am only 4 months after my release. I decided no more incarceration and meant it, and I am proof that once you put your heart and mind in positive directions God will lead the way." Copyright © Employment and Training Association Inc.